Historic Franklin, just three miles from Westhaven, is a throwback to days gone by. Remember when the downtowns were bustling, when stores with ornate facades were thriving, when people window-shopped, drawn by the attractive storefronts. Remember when diners sat at café tables outside the restaurants, and the owners knew your name. Remember your first kiss in the balcony of the gilded theater. Remember the corner ice cream shop, all pink and sweet, drawing you in. And office workers mingled on the street corner, discussing business, while working their way to the bank. Remember the festivals, and concerts and parades that gathered folks together to celebrate one event after another. How about the toy store, where kids stop in mid-sentence to stare at the colorful toys in the window. Franklin has won award after award from prestigious magazines—Best Place to Retire, Best Little City in the U.S. The list goes on. It truly is the best. It’s the kind of place where the motto is “If you’re in a hurry, you’re in the wrong city.” It’s the kind of place where cars stop for pedestrians, even if you’re jaywalking. Restaurants run the gamut from Puckett’s, a “Meat and 3” with rustic wooden floors and beat-up, mismatched chairs, but some of the best BBQ and sweet potato fries around, to the Red Pony, with it’s upscale, metro style and unique menu. And we can’t forget Merridee’s—the iconic bakery with nutty Viking Bread and the best breakfast rolls in the world—bar none. Are you tired of dressing like everyone else in the U.S. Then you need to visit some of the boutiques in Franklin. Guaranteed, no one else will be wearing the same dress at the next party. There is a Chico’s, but they’ve redeemed themselves as a chain store with their outstanding customer service. They actually know you by name and will call or email when something comes in that they know you’ll love or if a really good sale is going on. And, by all means, check out the lovely, historic homes with their lace curtains, beautiful architecture and graceful hanging ferns. The streetscapes are renowned; the local culture is equally beautiful. Franklin is the kind of place where volunteers showed up in droves to help the flood victims after the Flood of 2010. They tore out the drywall and hardwood floors of strangers and disinfected whole neighborhoods within days of the tragedy. No one asked, they just came. Need a gift? Meeting someone for lunch? Need just a few hours to decompress? 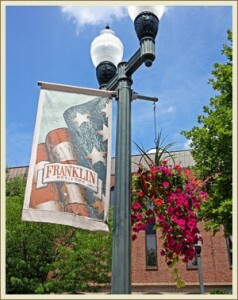 Go to Franklin. Just driving through will make you smile.